With only weeks left in 2018, the Alaska real estate listing photos we’ve captured for our clients this past month are already beginning to reflect elements on par with the latest in 2019 design trends: cool neutral palettes, mixed textures and materials, and silver hardware to name a few. Take a look at a few gems that we had the opportunity to photograph in the last few weeks! This shot perfectly embodies what to expect from 2019 design in real estate while lending to a sense of sophisticated simplicity that will carry its new owners through more than a single season. In just a single photo, we captured a variety of mixed materials and textures from textured barn door wood and faux stone on the mantel to the timelessness of silver fixtures and hardware surfacing in new builds and remodels alike. Neutral palettes with a sense of warmth, and stark walls leave spaces open for buyer interpretation of the perfect statement piece. The en suite was a great example of sticking to one material (stone) in a single, neutral palette (cool greys) in order to play with texture and pattern while leaving room for a buyer to infuse their own personality. Notice sleek silver hardware replacing the golds and coppers popular over previous seasons for a more timeless look and feel. In another home as photographed, we see a similar barn door treatment featuring a smoother texture to tie into the kitchen beyond finished in the same sleek-lined silver hardware. The combination lends to a timeless quality across living spaces. On the other side, this kitchen showcases a mix of textures and patterns from marbled glass light fixtures to faux wood tile flooring. One unique trend that we’ve seen gaining ground in our Anchorage real estate photography is a new wood finishing technique – carbonization veining over lighter wood tones. We felt the flooring choice here gave a nod in that direction, as well. 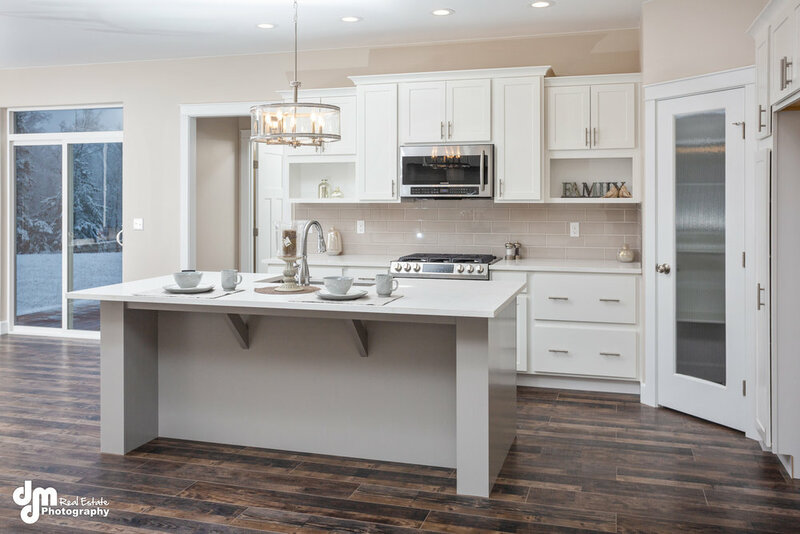 We also like the combination of traditional shaker style cabinets and ultra-sleek modern appliances. Sticking to stone-like surface options allows a multi-play on texture in a single space. 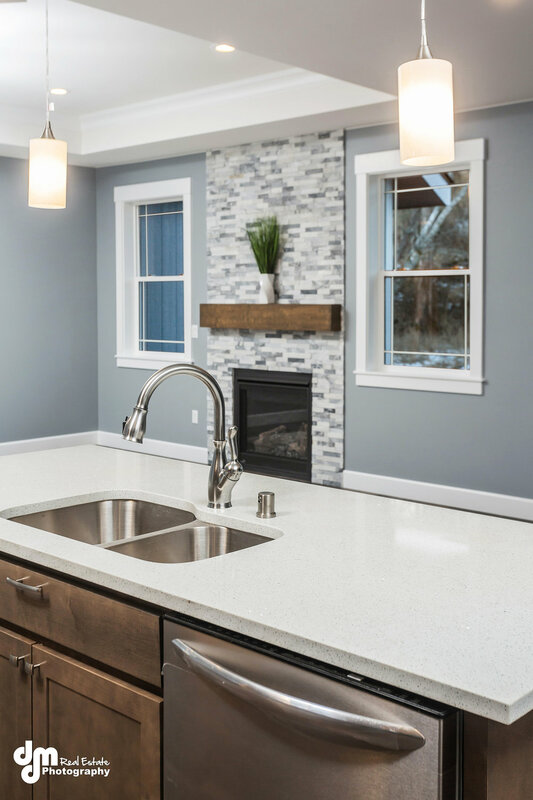 One timeless element of many great Alaskan homes is the breathtaking views, and this large over the sink window brings the forest outdoors right in. 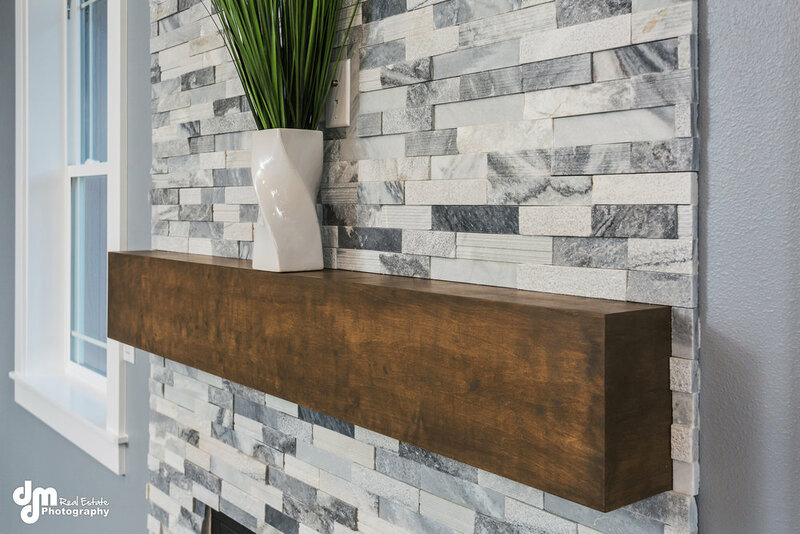 We’re charmed by this minimalist natural cut wooden mantel against the faux stone fireplace for a mix of warm, rustic traditional and cool contemporary modern. Another upcoming real estate design trend is using neutral base carpets when layering. This space was staged to showcase that neutral base carpet perfectly. It offers a sense of depth across the space while inviting buyers to imagine layering in those geo-patterned or faux skin accent rugs they’re thinking about in a palette that speaks to them. The simple elegant ceiling treatment offers a sophisticated but still casual feel, too. From across the kitchen, the stained cabinets below tie it into the living space with the complementing mantel. This home features windows at high heights and across rooms, providing an easy connection to the Alaskan beauty outside. And a use of mixed metals (silver hardware, cast iron stair railing & fireplace) combine contemporary and traditional. We love the mixed textures across flooring choices, as well. 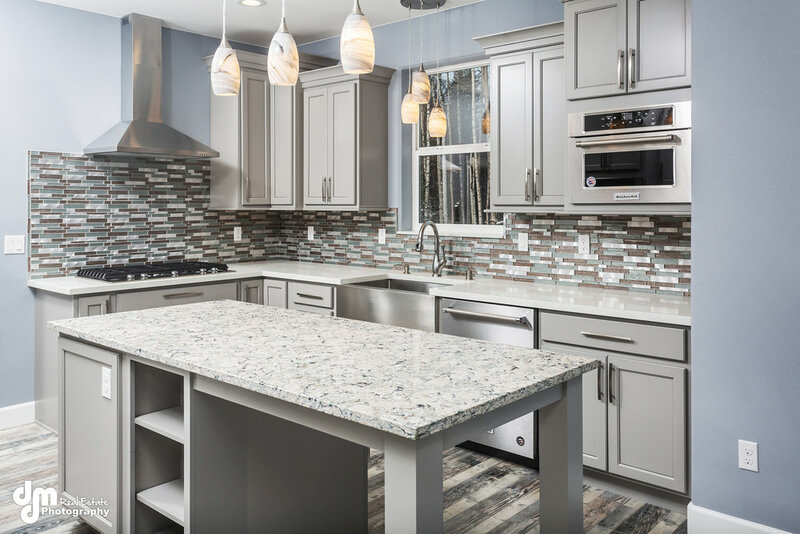 Check out the sense of symmetry from the left sliding glass panels overlooking a frosty Alaskan scene to the frosted pantry door on the right in this home. We especially like the backsplash choice, too – still neutral but slightly warmer than many of the combinations we’ve seen this month from other real estate photographer clients. That warmer neutral was carried over to the living space walls in this home, just calling for bold statement pieces. In contrast to the cool neutral palettes we’ve shared so far, another way to draw the outdoors in is through wood finishing and statement pieces made of wood like this unique wine bottle holder. Warm honey-toned woods bringing warmth into a space is one trend going strong for the last eight years or so, and in our real estate photography work, we’ve seen no sign of it slowing! The mixed metals – rustic copper sink and antique brushed hardware paired with modern stainless-steel appliances – caught our eye, as well. 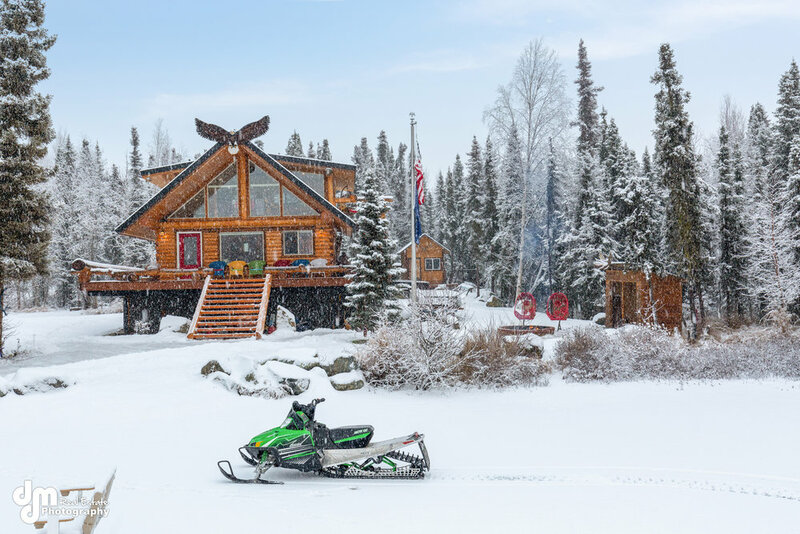 Of course, nothing can replace true traditional Alaskan beauty – a picturesque snow-covered log cabin before a backdrop of dusted pines and hints of living life well. Newer PostDMD Is Expanding to Fairbanks in 2019!